I’m sharing these pictures, taken in the backyard at Austin’s Roadhouse Relics, for the weekly photo challenge, cheeky. I recommend you take a look at the other submissions, if only to see Michelle’s cheeky parrot, shared for our inspiration. The figures along the roof are the cheeky bit in this picture, although the picture is doubling as a delaying tactic as I know there are increasing amounts of people with a fear of clowns. I assume quite a few of these are not familiar with the term coulrophobia, which makes me wonder why we give such strange terms to fears. Believe me, if you have a phobia, you want a good clear warning. Obfustication is the last thing you need with danger approaching (that word must have more than a hint of irony in it, surely?). I’m out of my depth here. I don’t know anything about bikes. So I’m not going to try to describe the bike bit. I’m not even going to make jokes about road hogs – after all, this one seems to be a bit of a sweetie. 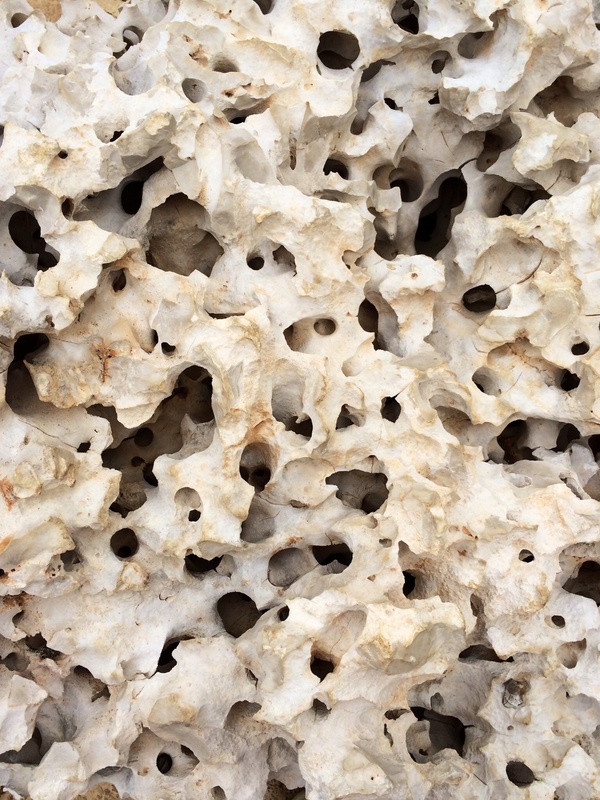 This is a close up of a large, limestone boulder, pitted with a network of holes. It was part of a water and rock installation we saw in the family garden at the Lady Bird Johnson Wildflower Center in Austin Texas. I’m sharing it in response to the weekly photo challenge: intricate.